Benedictine Monks first took possession of Welle Estate in Norfolk, England in 974 A.D. The herb gardens were established by the monks, which were the basis for the various potions and alms which were administered to the local populace, for they were as concerned for the physical well being, as well as the spiritual well being of their flock. Throughout the Middle Ages everyone relied upon the curative properties of herbs for the relief of their ills. By the end of 13th century, the recipe for herbal tonic had been recorded by the monks at Upwell, deemed by then to be “nature’s answer to tenseness, tiredness and lowness of spirits”. Thus Norfolk Punch was born. Over the next two centuries Norfolk Punch evolved and Welle Manor, which became home to the monks, was established. This continued until 1539, the time when Henry VIII dissolved the monastic orders and confiscated their properties. Fortunately the monks, who were one of the few educated groups were able to record the formula of Norfolk Punch. This formula lay hidden for centuries, until its discovery in 1980 by Eric St. John-Foti, who had purchased Welle Manor Hall. The process of reviving Olde Norfolk Punch took many years perfecting in order to keep the ancient recipe. The first batch was sold at the local church fair, just for fun but was so well received it was decided to make it commercially. Norfolk Punch was successfully developed and sold in the UK until it was again ‘lost’ for some years when production ceased. However the recipe was kept alive by Eric’s son Blair Montague-Drake, who has been making Norfolk Punch in Australia for many years. Happily Original Norfolk Punch has now been relaunched in the UK and is again being produced in East Anglia to the same original and secret monastic recipe. 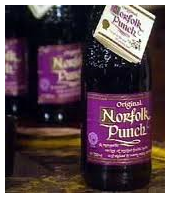 The modern Norfolk Punch gets its name from the 80 gallon "Puncheon" in which it was originally made. Today , WE MAKE NO MEDICAL OR CURATIVE CLAIMS, other than to relax warm and cheer.